The custom pieces shown below are here to give you ideas to help you convey the the look you have in mind. You may like the legs on one piece, the doors on another piece and decide on a carving from another piece. We can create a style for you that is all your own. We have provided the pictures below with style numbers for easy reference. Keep scrolling down! Custom Orders take 6 to 10 weeks or longer, depending on prior work orders, peak or off seasonal fluctuations. Give us your dimensions, wood etc. Custom made tables built to your specifications. Custom Order: Custom Orders take 6 to 10 weeks or longer, depending on prior work orders, peak or off seasonal fluctuations. Custom Order: Allow 6 to 10 or more weeks for completion. Completion times may vary depending on current work loads. Hand crafted, hand carved works of art. Strong and durable, built to last generations. Durable hand carved works of art, durably built to last generations. Custom Order: Custom Orders take 6 to 10 weeks or longer, depending on prior work orders, peak or off seasonal fluctuations. Hand made, hand carved works of art, built to last generations. 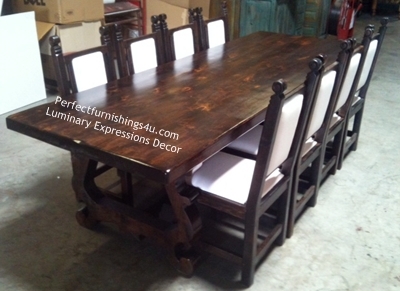 84" x 42" x 30"
Sample dimensions: 30.5" x 84" x 42"
84" x 42 x 30"
Arrange your new furnishings with Divine Flow. Allow the energies of harmony and prosperity into your home and business. Visit the links below for more info.